Promote a healthy, comfortable work environment with the help of WellFit standing desks from 360 Office Furniture! These desks convert from sitting to standing desks, and back again, in just seconds! Each desk has a maximum height of 20”, with 20 adjustment points in between, to match the height of any employee. Even with the maximum weight limit of 33 lbs., these desks adjust securely and effortlessly by squeezing the two handles on each side. The included dual gas springs will ensure it will glide up or down quickly and easily. The upper level is large enough to accommodate multiple monitors. The slot on the front is an added feature to prop a phone or tablet or for the storage of pens and other accessories. On the lower level, there is enough room for a keyboard, mouse, and other accessories. Unlike other models, these lift straight up and down, not out, so the desk won’t obstruct your workspace. Their firm bases sit on top of your existing desk without the need for any bolts or drilled holes. The only set up needed is mounting the keyboard platform using the included hardware to securely hand fasten it on. The WellFit line of standing desks create an ergonomic workspace that will endure the test of time without the cost of a typical standing desk. Available in 30", 35.5", and 43” widths, these pair great with our WellFit Monitor Arms as a perfect way to improve your employee's productivity while creating a space they will enjoy! 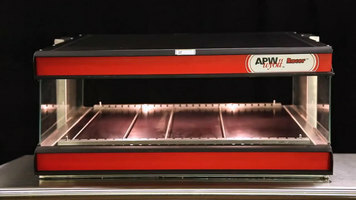 The APW Wyott Racer slanted merchandiser is an easy-to-use solution to your front-of-the-house, grab-and-go offerings. 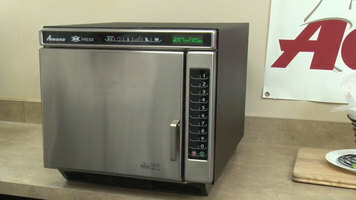 Simply remove the stainless steel rods to adjust the width for whatever food you're selling. It's easy to clean and looks great. Hoover's PortaPower vacuum cleaners use enough power for heavy-duty cleaning and feature the convenience of optimum portability. 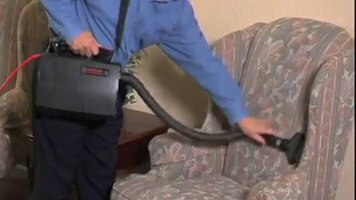 Watch this video for more information on how Hoover's PortaPower vacuum cleaners can enhance your cleaning capabilities.